A few years back I was in a mastering session and I met a dude who was a sound mixer at Fillmore. Dude -- I'm talking the Fillmore -- not even the Fillmore West. This guy was working there in like '64 and thought "Hey, why don't we mix the band from out in the house?" He remembers having to invent a way to split the microphones for the House and Monitor feeds. He mixed (and toured with) the Byrds and the Stones. He was at the studio I was at because he had multitrack recordings of Fleetwood Mac in '67 he'd recorded at the Fillmore that he found in his garage. So he called up Mick and said "You mind if I release these on my own label?" Mick Fleetwood said "Hell no, I'll release 'em myself!" And so now he was mastering the records for Mick's label. When this dude started doing sound they didn't have balanced microphone cables. They (and although he didn't take credit for it, possibly he) figured out that the front-of-house mixer had to be, you know, in the front of the house. When I got into sound, early-1980's, loud speaker/PA systems sucked. They were terrible. Horns sounded like crap and they were the only (somewhat) indestructible way to get loud sounds to go (roughly) in the direction you want them to. And the boxes had to be HUGE just to get any kind of low end out of them. And the sound out of them was (to be polite) non-linear. Or (and not to be racist) but very, very "honky". I wish I had a picture of these horrible 3-way Community cabinets I had in my back yard in 1984(?) (they were fiberglass, nothing could destroy them, unfortunately). They sounded like dog bark. A sound company lent them to me (Sound by Paul -- anyone remember them?) for about a year. Because, you know, they sucked. At the time, the best mixing guys (and yeah, back in the day the disparity of men/women in sound was even worse than it is now) would tune the crossovers as they mixed. Tune the crossovers while they mixed. Tune the crossovers. They were tuning the crossovers. Nobody tunes crossovers anymore. Heck, most crossovers are sealed up deep inside the electronics of little rack-mount processors boxes which only have an "on/off" switch on them. Why? Because at some point in the 1980's these geniuses in California -- whether it was Apogee or Martin or Meyer, or all of them at the same time like spontaneous generation of a brilliant idea -- realized that if they were building crossovers and EQ's that were specialized to the speaker cabinets they were making, they could ignore the straight-up physics of cabinet design and make up for the inherent problems and non-linearities of the physical speaker and cabinet by feeding the speaker with "processed" audio. Is your speaker cabinet too small for loads of low end? No problem, just electronically feed the box a disproportionate amount of that same low end (in exactly the right proportion, however, if you get my meaning) and voila! You have a little box that sounds BIG. Is there a mid-range "honk" you can't get rid of by mechanical or acoustical means? Use the magic of electricity to balance out your system. Problem solved. I remember those early Apogee boxes in the late 80's were noisy. The electronics in the processors were just hissy. But they were musical. The sound, out of the box, was good. And we didn't have to adjust the crossovers. The other thing that was new about these boxes with proprietary processors both before and after the amplifiers, was that you didn't have to do any EQ to make the box sound good (because that had already been done at the factory). So the only EQ you were doing was to try to make the terrible room you were in sound better. Oddly, it seems that they got the smaller boxes -- the 2-way speaker cabinets with 12" drivers and 1" HF drivers -- to sound good and then they started getting those big boxes -- the ones that you needed two guys to carry, 3-way with a pair of 12" or maybe a 15", a couple 8", and a 2" horn -- to sound good. But now all the systems sound good. Even the cheap ones. Even the custom ones made by some shop in Indiana or North Bergen, NJ. This is a big freakin' deal, and one we take for granted now. But hey, the entire world of pro audio in live sound has gotten good. We can do a lot of fantastic stuff -- and do it cheaply. Just look at this thing. It's two thousand bucks. And it will do whatever you want. 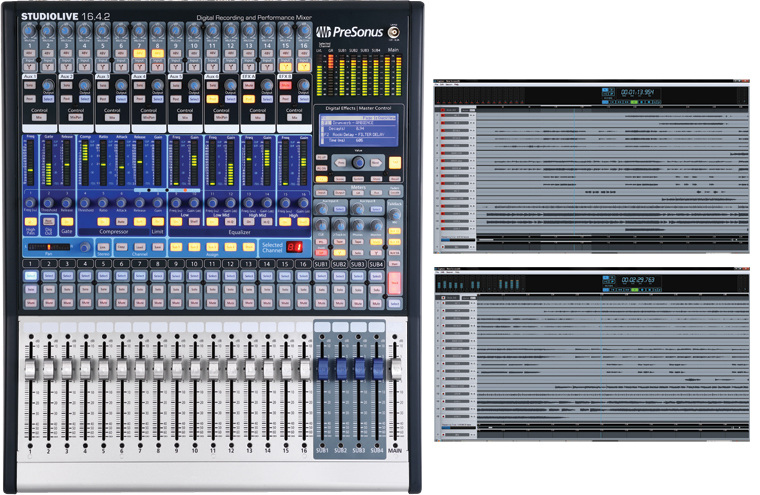 If you can't get your band to sound good with a mixer like this then the problem is your band doesn't sound very good. There ain't much you can do about it. With a mixer like this you don't need outboard EQ's. You might want them because they can be easier to use than flipping through menus and finding the offending frequency on the right output channel. But then again, you might not. And when you're short on dollars, space in the van, or just extra weight you want to carry then remember: you don't need outboard EQ's. Not anymore. Not for live sound. I've used the lower-end Yamaha mixers like the O1v (or whatever) and the... what is it, the DM1000? And you get used to the interface very quickly. With a mixer like this you are relatively low on outputs. But did I point out it's only two thousand bucks?